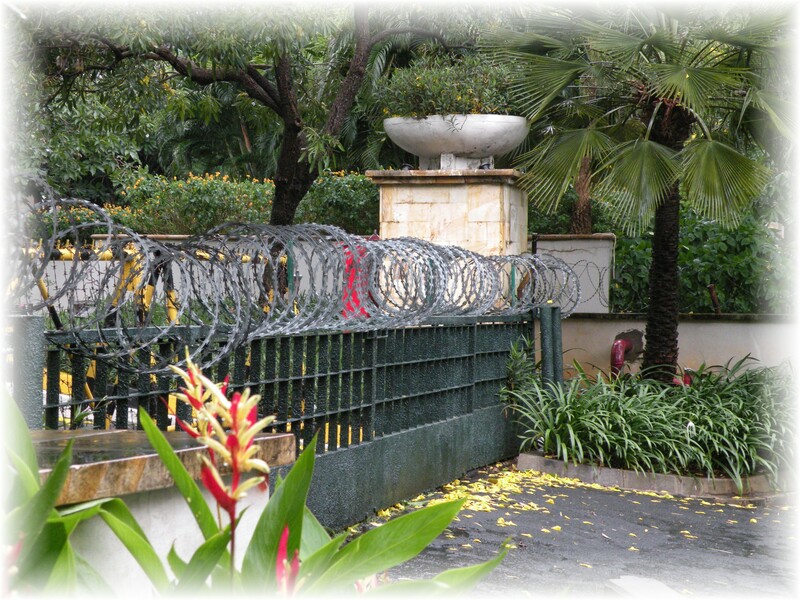 Entering any major hotel in Jakarta is a multi-stage process. First you pass by security staff near the entrance to the hotel at the street. Security staff look over the car, the passengers, and make a screening decision prior to allowing the car or taxi entrance into the hotel driveway. Then you have swarm of security staff checking under the hood, the passenger compartment, the trunk, and an examination of the under carriage with mirrors. Next, at the hotel lobby entrance, another metal detector, bag check, and a friendly “thank you” as you enter the lobby. Try to go to dinner, and another bag check at the hotel restaurant entrance. JAKARTA, May 14 (UPI) — Indonesian police have accused arrested terrorist suspects of planning to assassinate the president and foreigners. The alleged targets included Americans during an Independence Day ceremony set for August. The head of the country’s police force said the planned attack against President Susilo Bambang Yudhoyono was supposed to happen at the State Palace on Aug. 17. The four suspects, one of them shot dead during the police raid, were then going to declare Indonesia under the Islamic religious Sharia law. VOANews.com. Investigations continued Saturday into the Friday bombings at two hotels in Jakarta, Indonesia that left nine people dead and at least 50 injured. Little information about the bombings is being released to the public. On Saturday, Indonesian President Susilo Bambang Yudhoyono visited the sites where two bombs exploded at the Marriott and Ritz Carlton hotels. JAKARTA, May 12 (Jakarta Post) — The police’s counterterrorism squad has captured 17 terrorist suspects alive and shot dead five others in a series of raids conducted since Thursday last week. Spokesman for the National Police Insp. Gen. Edward Aritonang said the five suspects were killed in the latest raids on two separate places in Cililitan, East Java and in Cikampek in West Java on Wednesday. The police also arrested a suspect in Cikampek.. In Jakarta you cannot walk into a major shopping mall – particularly one catering to foreigners, without going through a metal detector and passing by several security officers trained to identify suspect behavior. Drive through the city center, and you will pass dozens of trucks with army and police forces waiting on standby to respond quickly in the event an incident occurs. All office buildings in the city center have similar security to the hotels, with multi-stage security checkpoints from the street to your office. Most are surrounded by barbed wire, high iron and concrete walls, and a density of security cameras that make London look weak. In the United States a potential car bomber in Times Square results in hours of “expert” commentary on the cable news stations, most of it meaningless babble produced by experts who have no clue what is really happening, offering only their opinion based on the same information available to any normal citizen by reading accounts from UPI, Reuters, AP, or citizen journalists. Americans are lead to believe we are the center of the war on terrorism, until you experience the level of security being delivered in a city like Jakarta. Indonesia, the fourth most populace nation in the world, is also the largest Muslim population in the world. Ordinary Muslims are not radicals, and my experience shows Indonesians treat each other with a level of respect and courtesy only dreamed about in a city like Los Angeles. Jakarta, as in any major city, has crime. However, having walked around most areas of Jakarta, and several other Indonesian cities, you do not feel threatened at the same level as a Caucasian may feel walking around East or South Central LA, parts of Brooklyn, North Philadelphia, or Washington D.C. The terrorists in Indonesia, as in most of the world, keep invisible, hiding in plain sight until their button is pushed to produce their violence. 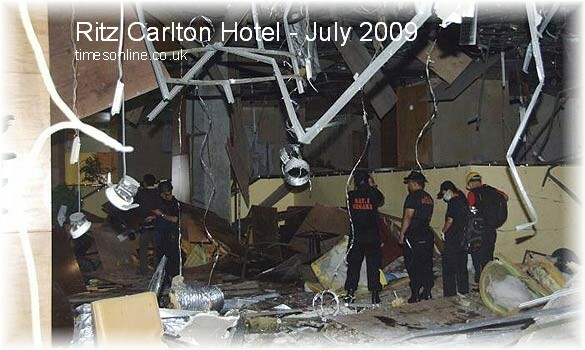 JAKARTA, Indonesia, July 19th 2009 (AP) — The terrorist attacks that struck two luxury hotels in the capital have shaken ordinary Indonesians who had grown more confident after waves of arrests had left the nation’s al-Qaida-linked militant network seriously weakened. Coming four years after the country’s last serious terrorist attack, Friday’s twin suicide bombings at the J.W. Marriott and Ritz-Carlton hotels in Jakarta unleashed a new wave of anxiety in the world’s largest Muslim-majority country. Co-workers in Indonesia are anxious to let foreigners know they are not terrorists. In any Indonesian office, you have a mix of Muslims, Christians, and indigenous religions represented among the staff. They all get along well, never argue over their ideologies or philosophies, but do occasionally compare notes on the difference in their faith and cultures. And of course there is a bit of friendly teasing and rivalry between those hailing from Sumatra, Java, Bali, or Kalimantan. Just like people from diverse cultures in any large country. When a foreigner enters the conversation, the talk does eventually work its way into opinions on terrorism. Most people are afraid, and want everybody to know that Indonesians are not terrorists. Much like the United States, in a country with nearly 260 million people there will be incidents that are violent, and not representative of the population. And they know Indonesia’s reputation as a sanctuary for terrorism is hurting their image. Times Online, July 17th, 2009 — Manchester United will not play their match against an Indonesia Super League XI in Jakarta on Monday following today’s bomb attacks. The club hopes, however, that the game can be switched to Kuala Lumpur, having arrived there this morning. At least nine people, including some foreigners, were killed and at least 50 were injured in two large explosions at luxury hotels in the Indonesian capital. Sir Alex Ferguson and his squad were due to fly to Jakarta tomorrow evening and to stay at the Ritz Carlton Hotel, one of the terrorist targets. As an international community, we need to offer countries like Indonesia our support in finding terrorists, and eliminating the threat from their country, and the world. As an international community we will have much better success protecting the safety and security of all nations if we work together as an international community, not only on a government to government level – but also on a human level. It is not an issue of Jews, Hindus, Muslims, Christians, or Buddhists – it is a matter of accepting each other’s differences, and working together to improve our global quality of life. Idaho’s white supremacist Christians are no better than Afghanistan or Pakistan’s Muslim fundamentalists – all distort and corrupt their claimed faith in the interest of power. And then preach their word through terrorism and violence against those who are not like them. In Jakarta the siege continues. After a couple days security in the face of everybody becomes oddly comforting. When I go to sleep in my central Jakarta hotel room I feel that I am as safe as possible from violence directed at foreigners in my hotel, and I have no problem presenting my backpack for inspection at a shopping mall or office building. I am somewhat saddened society has come to this point, but I am very happy Indonesians are just as tired of violence as anybody else, and have finally put their foot down and begun securing their country. Imagine having to pass through a metal detector and screening prior to ordering a latte at the Starbucks on San Fernando Rd in Burbank. That is Jakarta. interesting. although it seems like too much security…rather be “free” and risk what appear to be normal situations…i certainly won’t stop taking the PATH to NYC every day….live life and see what happens! It is a lot of security, however they have had a bad run with violence over the past few years. On the other hand, I would not complain if the PATH had a higher than average number of undercover cops hanging around.